Twice a week I go to the local recreation centre's pool and have an hour long Warm Water Stretch class and I love it. I have been doing it for about 4 years now. There are several reasons why this is a great experience. First I should explain what Warm Water stretch is....the pool is 92 F degrees and is the perfect temperature for those suffering from arthritis or recovering/preparing for/from knee/hip replacements or bad backs. The average age in these classes is about 75 years old with most even older than that, we also have men as well as women. Now a lot of these people having been taking the classes for 15-20 years and they are a hoot! I enjoy being called the baby of the class or girly (it has been a long time since I was called girly) and they are a fun bunch. These wonderful people all get together and plan different social events anything from attending plays to going to the race track or shopping trips to the U.S. they are just out to have some fun. Yesterday I was fortunate enough to attend one of their trips. We went on a "Christmas Lights Journey" and it was fabulous. 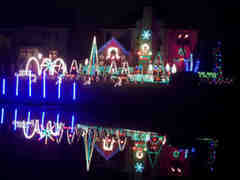 A small town about 2 hours sw of Toronto called Simcoe is known for their Christmas Light display. So we rented a coach and 55 of us loaded on and we took the hour drive from Hamilton to Simcoe. Now just looking at lights is too tame for these people so we also went to a museum that represented the county then drove another 1/2hour to a small village called Delhi and went to the Hungarian Club who hosted a wonderful buffet dinner at 4:30pm in the afternoon..did I mention the average age is 75?? After dinner we had a step on Guide provided by the town of Simcoe and she took us on a journey through out the town looking at some fabulous Christmas displays. There was lots of ooowwww and awwww going on and some carols being sung. We were having a wonderful time. After the light displays the Town hosted a small craft fair and served us Hot Chocolate or Cider and we wandered looking at crafts. Then we all loaded back on the bus still laughing and smiling. Once we were seated someone from the back of the bus shouted "Now time for Ice Cream!!" 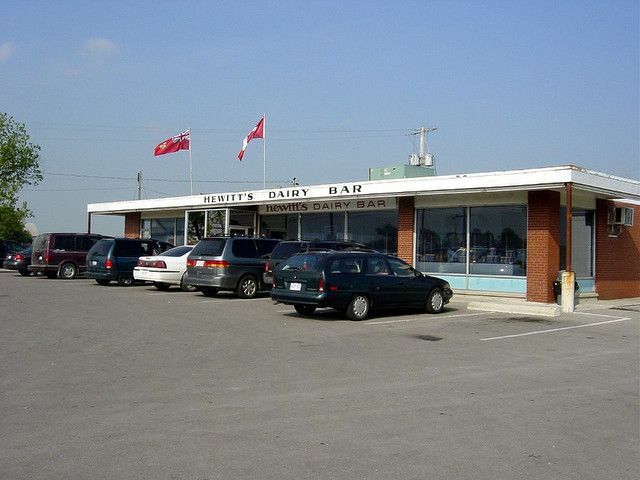 there was a general whooping and agreeing, in some cases demanding we go to this special Dairy Bar that was on the way home. They make all the ice cream in a plant that was behind the bar. So off we went, all 55 of us getting off the bus at 9pm at night and standing in line for ice cream cones, sundaes and shakes. There was much laughter over the flavours picked by each one...and even some ice cream cone fights ..did mention the average age is 75? So now on an ice cream high we loaded back in the bus and took off towards home...but wait the coach driver said he knew of two fantastic light displays in a small town that we had to drive through on the way home, the town of Caledonia so everyone agreed and off we went. These displays were fantastic, one of them even had music that was coordinated with the lights flashing. As we drove back to our final destination book talk started and a number of the ladies had read Fifty Shades of Grey by E. L. James and were now reading Bared to You and the sequel and Reflected in You by Sylvia Day. ummm... did I meantion the average age was 75??? After much giggling and arguing about the best bits of all the books and I might say some pretty graphic language they all looked at me and wanted to know what was the next naughty book they should read. I blinked innocently at them all and asked why they were asking me? They gufawed...yes actually gufawed in my face...apparently I'm the one who recommended these books originally to one of the ladies and word got out LOL. So I suggested they try The Shadowland Series by Cherise Sinclair. Finally at 10:30pm we arrived back in town as the coach was rolling into the parking lot the oldest of us Mary at 92 squeeked out, "What, are we done? Already?" she was bright eyed and bushy tailed and still raring to go. I personally was tired and my sugar high was wearing off. Mary was disappointed we were done and wanted to do it again tomorrow. I slowly dragged my tired body back to my car and all I heard was the laughing and hollering of these supposed elderly members of our society...did I mention the average age was 75? ?